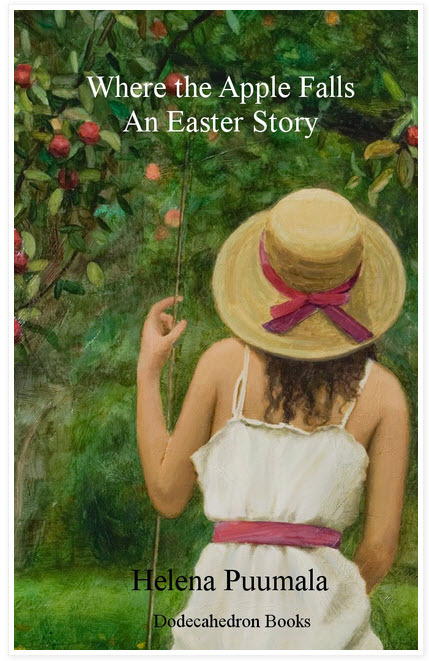 Helena Puumala's Easter short story "Where the Apple Falls", will be free for the Easter weekend on Amazon. To be precise, that would be the five day period from Thursday March 24 to Monday March 28, 2016. This short story (approx. 6500 words) focuses on the complex and somewhat troubled relations between children, parents, and grandparents. It also revolves around the mysterious forces of the universe, including the various notions of the divine held by the people in the story, which sometimes conflict, much as they do in the world in general. An Easter service and a freshly planted apple tree draw the parties together, over one fateful Easter weekend. The story is the middle story of a 3 story holiday cycle, set in a Northern Ontario lake community, that explores some spiritual and family themes, concerning conflict, forgiveness, acceptance and love. The cycle begins with "The Boathouse Christ" (Halloween), continues in "Where the Apple Falls" (Easter) and concludes with "A Christmas Miracle at the Lake" (Christmas). Naturally, any of the 3 stories can be read and enjoyed on its own, but next week, they will be bundled together into one convenient volume.